Suffering from being in the middle of a construction zone adjacent to City Creek Center, Martine Cafe co-owners Scott Hale and Tom Grant decided to close up shop for a few weeks and give their restaurant a design reboot. Gone is the dining room drywall; now on display are the original red bricks of the historic building that is home to Martine. The walls of the restaurant's west dining room feature the artwork of the late painter and beloved raconteur Kenvin Lyman. Hale and Grant did much of the redesign themselves, including building new banquettes. I'd waited too long to check out the new Martine, but recently did explore the new digs and the beautiful, warm ambiance the owners have created. Renovation aside, it's a tribute to chef and co-owner Grant—who's been with Martine from the beginning, in 1999—that the cuisine at Martine never seems dated or tired. Options abound: a collection of "small plates" allows patrons to enjoy a range of dishes and flavors, while larger entrees like pan-seared sea bass with couscous and saffron broth ($24) provide more traditional meals. And then there is a duo of economical three-course ($25) and four-course ($32) prix fixe menus. At Martine, you can have it your way. No sooner were we seated than a terrific server with a memorable name, Venice, brought us ice water and a gratis bowl of olives. The wine list at Martine is excellent and affordable; markups on most wines are less than what you usually find, so give credit to Hale, a wine enthusiast, for that. We settled on a versatile bottle of Guigal Côtes du Rhône Blanc ($30), which we figured would pair well with a range of dishes. The "Bar Bites" menu offers tasty nibbles that are a great way to kick off dinner: fried Brussels sprouts with pancetta ($5.50), Spanish anchovies with roasted peppers and olive oil ($4) and skewers of sliced Creminelli salami and Rockhill Edam cheese ($4), for example. Grant has a knack for taking simple ingredients—local and organic, where possible—and elevating them in delicious dishes. The flavors are complex, but not complicated, overwrought or over-thought. A sweet-pea soup ($9), for example, is all about the sweet peas, enhanced judiciously with a kiss of lavender and Shepherds goat cheese. 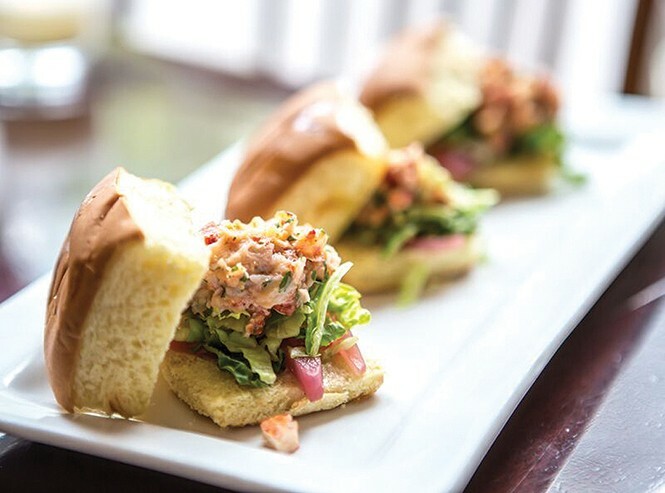 The lobster-rolls ($15) tapas plate is a serving of three squares of toasted brioche topped with heavenly tarragon-spiked lobster salad and pickled red onions—a wonderfully satisfying dish. Other enticing items from the Tapas & Soups section of the Martine menu include deeply flavored wild-boar ribs with a sweet and tangy pomegranate barbecue sauce and garlic chips ($10); heirloom tomato gazpacho soup with marinated shrimp and avocado crème fraîche ($10); mushroom escabeche with rosemary-grilled bread ($9); crab salad with Belgium endive and artichoke heart ($14); and rich, roasted shiitake mushrooms with rapini and hoisin sauce ($10). I don't normally think of fish as a candidate for pairing with tomatoes, but I do now, thanks to a divine plate of roasted halibut atop a bed of charred heirloom tomatoes. The halibut was cooked perfectly, and the tomatoes lent acidity to provide both balance and contrast to the fish flavors. It's a very creative combination. My teenage son, Hank, allowed me a nibble of his gorgeous lamb rack ($28), cooked medium-rare, as requested. The dish is composed of four ribs—two ribs, each separated into two pieces—artfully stacked on a generous serving of blistered, charred green beans which sit on a bed of corn grits, all drizzled with balsamic vinegar. It's a lamb-lover's dream dish. Another must-try Martine dish is the Mystic wild Alaskan salmon ($24), which is flown in freshly caught from the Yakutat district of southeast Alaska. Mystic owners David and Shannon Negus offer only sustainably managed premium-catch salmon to their clients, and I defy you to find tastier salmon than Grant's. The richly colored—almost burnt orange—salmon is served on a bed of greens and topped with stone-fruit chutney, with a mound of yogurt quinoa alongside. It's another interesting and successful combination of flavors that you might not think of putting together, but Grant does. Ordering duck in restaurants, I feel, is always a crapshoot. I've had so many overcooked, undercooked and just plain underwhelming duck dishes that I generally shy away from them. But Martine's boneless duck breast ($24) was stupendous—so good, I had to share half of mine with Hank, who normally doesn't eat duck. It's a generously sized duck breast, cooked medium-rare and cut into thin slices, served with a subtle curry vinaigrette and roasted shiitakes. Again: It's an unexpected combination of flavors—curry vinaigrette and duck—that simply works. A serving of crispy sautéed kale rode shotgun alongside, and I had to fight Hank for the duck-skin cracklings that rounded out this exquisite dish. 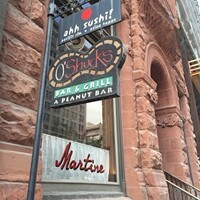 Although I've focused here on the dinner menu, Martine also serves lunch, offering mostly pub-style fare such as paninis and sandwiches, salads, quiche and soups. The Thai red-curry beef skewers ($11) on house linguini are a real winner, as is the Southwestern-influenced hot roast-beef sandwich: tender roast beef with red bell peppers, poblano chile, onion, pepper jack cheese, spicy au jus and chipotle mayonnaise on a fresh baguette ($10.50). If the distinctive ambience and cuisine aren't quite enough to get you through the door, I'll remind you they also offer valet parking right at the front door, making a night out at Martine both effortless and delectable.